Any business that handles large amounts of cash transactions such as a restaurant, bank, casino, or retail store should consider investing in a commercial safe that can safely store their cash, keys, jewelry, and other important business documents in a secure environment. Purchasing a commercial safe can be one of the most important decisions any business owner can make. Commercial safes are bigger, harder to break into, and more fire resistant than your average residential safe. 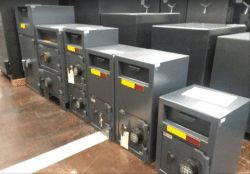 These safes are rated for both how long they can withstand common attacks from criminals, as well as how long they can be in extreme temperatures while still keeping its contents safe. Businesses need a way to protect their assets from theft and fire, and keeping their cash and other valuables in a commercial safe is one of the best ways to do so. Any business owner who oversees operations with a high risk of fire, such as a restaurant or a manufacturing plant, should consider purchasing a fire rated commercial safe. A fire rated safe can keep valuables and other important business documents safe from fire anywhere from 45 minutes up to 2 hours, even during extreme conditions. In 2015, there were 113,500 reported fires from commercial buildings which caused over 3.1 billion dollars worth of damage. Some of these losses could have been mitigated had the owner stored their valuables in a fire rated commercial safes. A UL rated safe is one that has been certified by Underwriters Laboratories for its ability to resist common attacks from thieves. These are some of the most secure safes on the market. Combined with a high security alarm system, these high security commercial safes can stall thieves from accessing the safe, while allowing enough time for police and other law enforcement to arrive and diffuse the situation. These safes are rated for how long they are able to withstand common attacks such as picking, prying, and drilling. 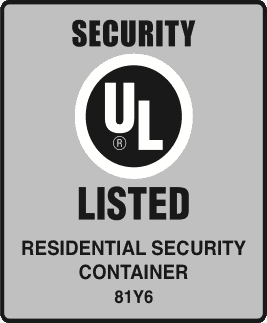 Here are the different UL ratings and what they mean when it comes to the security of your safe. RSC (Residential Security Container) – The door of the safe successfully resisted entry for 5 minutes when attacked against rigorous prying, drilling, punching, chiseling, and tampering attacks by UL technicians. TL-15 (Tool Resistant for 15 Minute) – The door of the safe successfully resisted entry for 15 minutes when attacked with common hand tools, picking tools, electric tools, grinding points, carbide drills, or pressure applying devices. TL-30 (Tool Resistant for 30 minutes) – The door of the safe successfully resisted entry for 30 minutes when attacked with common hand tools, picking tools, electric tools, grinding points, carbide drills, pressure applying devices, abrasive cutting wheels, and power saws. TL-30x6 (Tool resistant for 30 minutes, all 6 sides) – All six sides of the safe successfully resisted entry for 30 minutes when attacked with common hand tools, picking tools, electric tools, grinding points, carbide drills, pressure applying devices, abrasive cutting wheels, and power saws. Most commercial safes come with a cash rating which states how much insurance companies will pay out if the security of the safe has been compromised. These cash ratings are determined by the UL rating of the safe, as well as if other security measures are installed, such as a burglar alarm system. It’s also imperative that the owner has the safe bolted to the ground. Here is a general idea of how much insurance you can expect based on the UL rating of your safe. 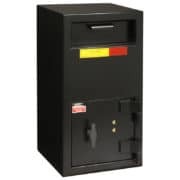 Cash Drop safes are ones that are designed specifically for depositing money. These safes are normally installed next to a cash register in order to limit the amount of cash the store has to make change with. A pizza shop owner can minimize their risk of theft by installing a drop box safe that allows drivers to safely deposit their cash in between deliveries. 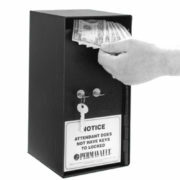 Landlords can also set up a cash drop box outside of their office so tenants can easily pay their rent by depositing checks inside of a commercial drop safe. Depository safes generally have a large horizontal upper door that swings open when the handle is pulled. When released, the door swings shut, similar to post-office mail boxes. This access door is large enough to fit items other than cash such as bank deposit bags, car keys, sales invoices and other important business documents inside. These safes offer the convenience of easy depository access, while protecting the valuable content. They are ideal for businesses by protecting their assets from employee theft and burglary. Depository safes are perfect for restaurants, bars, car rental companies and after-hours delivery services. Casinos can also benefit as they generally deal with high volumes of cash transactions. How do you know which company to purchase your commercial safe from? You’ll want to choose a commercial safe from a reputable dealer with a brick and mortar location. Our knowledgeable and friendly staff here at Houston Safe and Lock can help you select a safe that fits your security needs as well as your budget. We have the largest inventory in Houston with over 400 safes to choose from! We can also deliver and mount your new safe, as well as any future servicing that may need to be done. Give us a call at 713-659-3951 or stop by our showroom today! We are Houston’s leader in security.